We have a full liquor bar serving the “coldest beer” on the lake! So after a long day on the lake, stop by and have your favorite beverage. We are always trying new things on our menu. Always affordable! We take great pride in the food that we serve. We have appetizers, burgers, salads, wraps, chicken tenders, chicken dinners, baby back ribs, shrimp and Friday fish fry! We have one of the newest & best fish fry’s around! We have Happy Hour Wednesday through Saturday from 3 pm to 6 pm. Daily Specials every day. 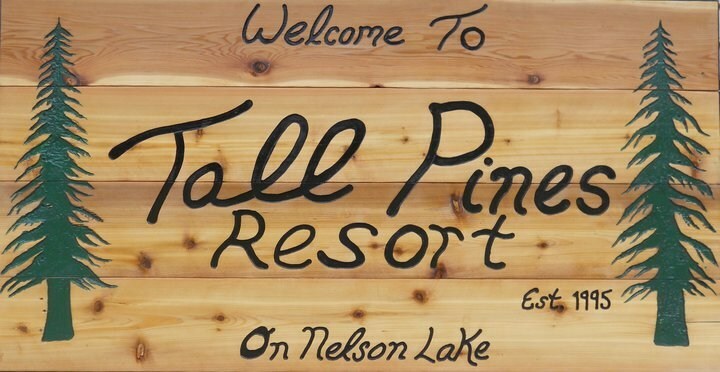 Tall Pines Resort are proud members of the Nelson Lake Resort Association, Nelson Lake Association, Hayward Lakes Visitor & Convention Bureau, Walleyes of Northwest Wisconsin & North Country Rider’s Association.